You can adjust the Color Matching and Color Options settings to fine-tune the colors in your printout, or turn off color management in your printer software. Select Color Matching from the pop-up menu in the print window. Select Color Options from the pop-up menu in the print window. 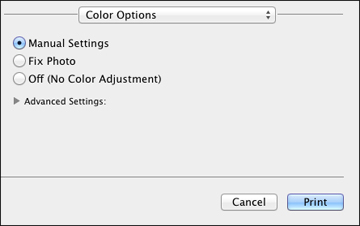 Note: The available settings on the Color Options menu depend on the option you selected on the Color Matching menu.